The Leupold GX-3 is the latest in Leupold’s line of tournament-legal laser range finders. Introduced in 2010, it sports a more durable frame than its sister device, the Leupold GX-1. It’s also flashier eye candy, and is sure to draw some “ooh’s” and “aah’s” from your buddies when you first unveil it on the course. The GX-3 can provide distances up to 800 yards and can cut right through fog and rain to provide accurate measurements. This range finder has become a favorite for many golfers and it is highly recommended for anybody in the market for a new range finder. The Leupold GX-3 is considered to be more rugged than its predecessor the Leupold GX-1. It has a solid aluminum frame and for many golfers is more attractive looking as well. It also differs from the Leupold GX-1 by giving you a red OLED readout instead of the black LCD. This helps the golfer to see the distance better against dark backgrounds. 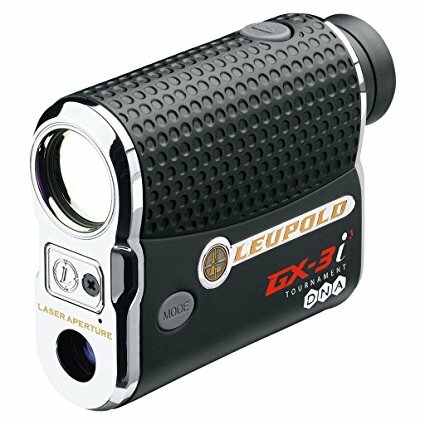 Just like the GX-1 the Leupold GX-3 is legal for tournament play and they both cut through the fog to return accurate yardages. Since the Leupold GX-3 is lightweight and is not as big as some of the other range finders on the market you can actually carry it in your pocket or easily on the outside of your bag. It is also much easier to use in your hands than trying to use a larger range finder that is very bulky. The Leupold GX-3 can shoot targets up to 800 yards away, which is much longer than any golfer would ever need considering even the long drive competitors can’t hit the ball over 500 yards. It will display the distance in vivid red OLED that is easy to read against any background. Even though you may not ever need the Leupold GX-3 to shoot a distance of 800 yards for you, the good news is that it can acquire the distance from 300 yards and in very accurately without picking up objects that are not your target. The Leupold GX-3 fires a laser beam right at the target and returns the distance to the target accurately with Prism technology. Even though the 6x magnification is not the highest you can find in a range finder it is plenty to give you accurate numbers for the distances of a golf course. The magnification is allows the golfer to lock into the flagstick from longer distances without nearly as much trouble as some of the other models that are on the market. What makes the Leupold GX-3 so different from the GX-1 and the other range finders that are on the market is the red OLED display. This is a big deal because many range finders only display the distance in black and this can be very hard to read against a dark target like a tree or on a day that the sun is not exactly shining bright. This will take the guess work out of the distance you are shooting and it will allow you to get an accurate distance that you can read much easier. The display of the Leupold GX-3 is one of the favorite features of users and it is considered be far superior to the typical LCD displays that are almost always in black. With this Leupold range finder you also get a scan mode that will give you multiple distance readings all at once. This means that when you are trying to find the right distance you can easily see all the distances from your target back to where your golf ball lies much easier and much faster. The Leupold GX-3 is one of the best range finders on the market and the lightweight makes it easier to carry on the golf course. You already have clubs, golf balls, and many other things to weigh your bag down and you don’t need to add more weight with a bulky range finder. The GX-3 is the perfect size for handheld use and it is easier to keep steady when shooting longer distances as well. It can shoot right through fog and bad weather, which means you don’t have to guess when the weather is not all that good. The scan mode is a very popular feature and can help you see all the yardages you need. You also get a display that you just cannot find with many other range finders. The red display will make it much easier to know that you have an accurate distance to the target you are aiming for. Even though it does not take a very common battery like other range finders the batter will last longer since it is Lithium. Plus the CR-2 Lithium battery is used in many other electronic devices and it can easily be found at any department store. You will get more hours out of this battery than the standard 9-volt that most range finders take. The Leupold GX-3 is a very smooth functioning range finder and it finds the target very accurately and fast. It is much more rugged than the GX-1 due to the aluminum body and it is also weatherproof so that you can use it whenever you are playing golf. We are hard-pressed to find anything to complain about with this device. Except, as we’ve mentioned in previous Leupold reviews, we wish Leupold would match Bushnell’s two-year warranty. There is not much to complain about with the Leupold GX-3 range finder and the reviews from actual owners have been overwhelmingly positive.